At a more focused level, Baptists find biblical support for the congregational form of church government, Presbyterians believe that government by teams of Elders/presbyters is more biblical, and Anglicans hold that hierarchical government with an Archbishop at the head is the truest biblical model. Then there are the issues of baptism, talking in tongues, end time scenarios and many other hotly debated interpretations of scripture. Perhaps this is as it should be. Perhaps the Lord Jesus, the head of the whole church and every church in particular, wants us to experience a range of key beliefs and practices. I don’t think this can be so because it sure makes it hard to find unity and it certainly confuses most of us. So if the problem does not lie with the Lord, or with the Bible itself, then it must lie with the way we interpret the scriptures. I know it wouldn’t completely solve the problem, but it would really help if we could all agree on an interpretive key that would unlock the essential meaning of the scriptures. But what would constitute such a key? Perhaps a place to start is to acknowledge that any such key would need to be revealed and not devised. The Bible is a divine/human collaboration yet its truth content is revelatory. By this I mean that God has chosen to reveal truth to us in and through the scriptures and our task is simply to comprehend this truth. Jesus conveyed this concept to us when He said that only one who comes from heaven can convey heavens truth (John 6). So any key to understanding the Bible must be revealed rather than logically constructed. To meet this criterion any interpretive key needs to be stated, explicitly or implicitly in scripture. The TULIP of Calvinism does not, to my thinking at least, meet this criterion. Some might argue that Romans 8:30 sets out the general TULIP idea but it doesn’t really, particular within the context of what Paul is teaching in that section of Romans. The so called dispensations also have no reasonable biblical origin. Both TULIP and the dispensationalist framework are contrived systems of interpretation. So what interpretive key does indeed satisfy the requirement of being divinely revealed in scripture itself? To borrow an expression from a popular television series, “you will find out after the break”. Until my next posting then, please would you give some thought to this question. My previous postings and the title of this post makes it obvious where I am going with this but it would be great if you could think about it and then interact with me as I develop the concept further in future posts. To help a little with this process I have included a poll – please would you select the one option that comes closest to your idea of an interpretive key to understanding the Bible and comment with your answer, and why if you would like to explain your choice. What is the key to understanding the Bible? 3. Literal plain sense of the text. 5. 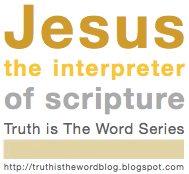 Jesus’ nature as revealed by His words and deeds. Calvinism is very popular at the moment but the five tenants they believe in make me uncomfortable. Perhaps in a future blog you could look at Calvinism and why it is so popular, and if it is right at all. I think a lot of people goto Calvinist churches without thinking about the theology.